The Ha Long night market at Bai Chay is a collection of stalls selling various Vietnamese products. Trading can be done in Dong, USD, Reminbi and even Malaysian ringgit. 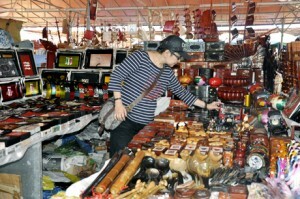 What to buy: Lacquerware, the famous Vietnam lady wooden statues, T-shirts, traditional Vietnamese dress etc. Basically souvenirs. What to pay: Bargain heavily! The starting price would usually be 30-40% above fair price. When you visit the Amazing Caves (Hang Sung Sot), as it’s a very busy bay full of other tourist junks, you’ll see a few boats that act as floating shops. They sell snacks, biscuits, drinks, cigarettes and even fruit and vegetables. You name it, they’ll probably have it but as you’re far from any conventional land based shops, expect to pay that little bit extra. If you want to purchase alcohol or snacks while on your junk in Ha Long Bay, have no fear. Each evening, as the sun begins to sink on the horizon, the waters fill with “floating convenience stores”. Local woman row boats filled with goodies up to the junks and sell their wares. What to buy: Selections include, beer, vodka, cigarettes, potato chips, cookies and other snacks. What to pay: As is the case all over Vietnam, the prices aren’t set so bargain. The snacks and water bottles are neatly packed into the small boats. Never seen anything like this before. Very unique and nice. What to buy: Ritz, Mineral Water, Beer, Crackers, Potato Chips, Fruits, any snacks you fancy. What to pay: Quite expensive, a bottle big mineral water will cost you 20,000 Dong. You can get it for about 7,000 Dong on the mainland. The night market in the town of Bai Chay is a collection of open air stalls that sell a wide range of traditional Vietnamese souvenirs like laquerware, chopsticks, trinklets etc. The stallholders will quote you the price in US$. You will have to bargain for the price you feel is right for the product. Offer them 50% of the quoted price in VND. If you are not satisfied with the final price offered, move on to the next stall – another stallkeeper could be willing to sell you the item at your price. Vietnamese dolls: dressed in the traditional Vietnamese long dress, the `Ao dai’. What to pay: The price that you will be quoted for a set of 20 chopsticks will range from $3 – 5 depending on the design. local boats selling live seafood: The freshest shopping … ever !! This “shop” is actually a boat. We were on our boat in Ha Long bay when we came across sort of like a water-village right smack in the middle of the bay. And soon, this diminutive lady came by in her boat, selling fresh prawns, lobsters, fish, shellfish and the works. There were boats that would come up to the junk boat tours selling fruit and other snacks.